You probably have thousands of digital photos, documents and files that you want to backup or copy to an external media or to another computer. For example, copy everything to an external drive for safe keeping. ViceVersa Pro is a powerful file sync and backup software for Windows that lets you synchronize, copy, backup files across computers, PCs, servers and external (USB) disks. Sync, Backup, Copy files across computers and disks. File Synchronization and a lot more: File Backup, Replication and Mirroring. Schedule ViceVersa PRO to run unattended: the program will work in the background, using a minimum amount of resources, and constantly copy your files as needed, so you know you will always have a 1:1 copy of your data. No limit on data size or file size, ViceVersa PRO is designed to work efficiently with millions of files. Plus file encryption, file compression, bandwidth control, file archiving, password protection, CRC verification, file permissions and much more! ViceVersa Pro can be used to sync files and folders between a desktop and a laptop, home and office computers, multiple servers and removable devices (USB Keys, Flash Drives, CD-RW discs). On Windows servers, ViceVersa PRO can provide a synchronized mirror of files and folders, scheduled or in real-time, for high availability, disaster recovery, load balancing and web farms. 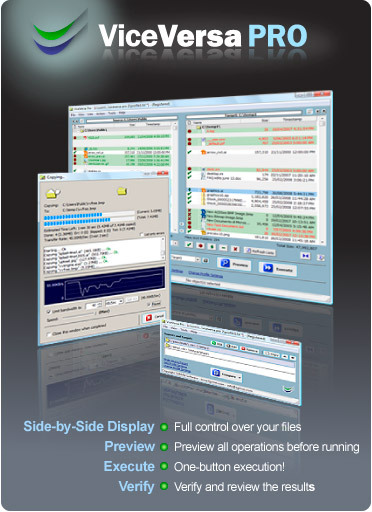 ViceVersa PRO supports one-way and two-way file synchronization and file replication. Each copy operation is reported in a detailed log file. You can configure ViceVersa to send notification e-mails at the end of a run. ViceVersa PRO is designed to handle terabytes of data. Each profile handles up to a million files and multiple profiles can be defined to run in parallel or sequentially. ViceVersa PRO can even replicate / backup Hyper-V machines. Learn more about Hyper-V Backup with ViceVersa PRO.